* Selected participants are provided with hotel rooms. We visit Beopjusa (temple. built on AD 553) at Mt. Songni and have Korean traditional dinner. See Timetable. You might find these cards useful. ICN (Seoul-Incheon airport) is the largest airport, connecting to most of the countries. 1. Purchase a bus ticket to Daejeon Government Complex (roughly 20 USD). 3. It takes roughly 2 hour 30 minutes to Daejeon Government Complex stop. 4. Walk to the Toyoko Inn; see the map below. Regular price : KRW23,100, Night price : KRW25,400. From Daejeon train station, you can take a taxi or a subway. You may want to show a Korean language card to the taxi driver. Still another way : ICN -> AREX (Airport EXpress train) to Seoul Station, and KTX to Daejeon, and taxi or subway. 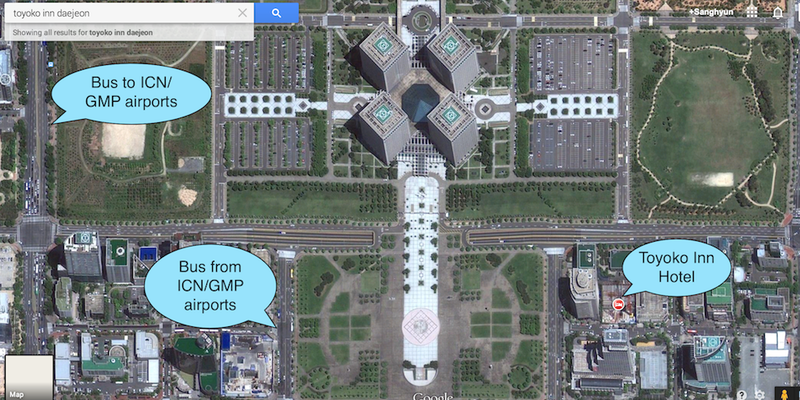 GMP (Gimpo airport) also connects to some Asian countries including Japan and China. Slightly closer to Daejeon than ICN, but less frequent bus connection. Purchase a ticket and take a bus to Daejeon Government Complex. It takes roughly 2 hours. There is a KTX (Korean eXpress Train) from Seoul Station to Daejeon Station several times each hour. Reservation is usually not necessary except for Fri/Sat evenings. You may want to show a Korean language card to the taxi driver when you arrive at Daejeon Station. We provide a bus ride to ICM site on August 12. Or, take a taxi or shuttle from Toyoko Inn to Daejeon Station. It takes an hour by a KTX bullet train to Seoul Station (every hour or more often, until 11:30pm). 인천공항 가는 표 한 장 주세요. Walk to the stop (see the map), purchase a ticket and take a bus to ICN / GMP. The stops from airport and to airport are different. We don't have the current time table so please check at the terminal.